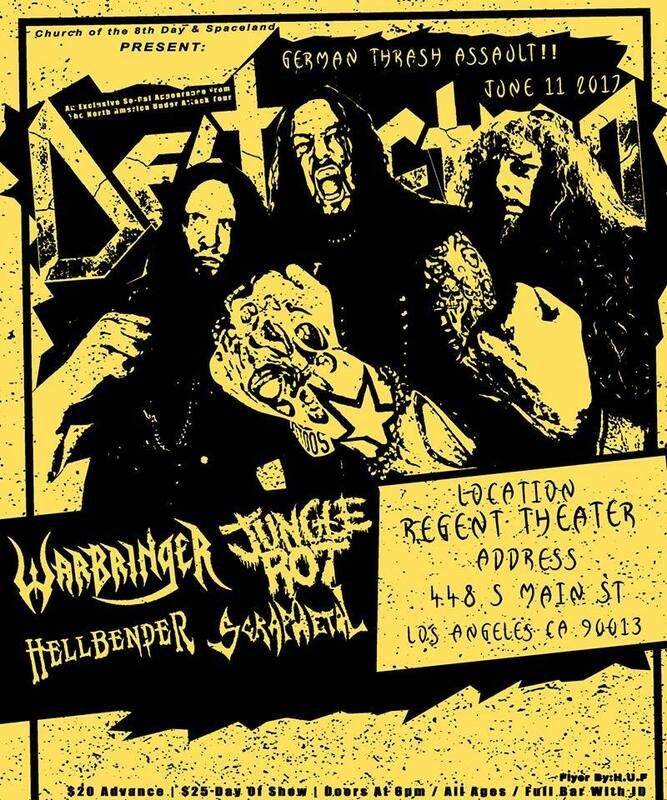 German thrash legends Destruction are currently on the road, destroying stages all across North America, with support acts Warbringer, Jungle Rot and Hellbender. The tour will arrive in downtown Los Angeles for a gig at The Regent on Sunday June 11th. Metal Assault in association with Spaceland Presents and The Regent is giving away one pair of tickets to this show. Giveaway is open now through Friday June 9th 11:59 PM PT. Winner will be picked at random and contacted on the morning of Saturday June 10th. Please use an active email address to sign up for the giveaway. Please check your spam folders for the winning notification too, just in case, and/or add MetalAssaultLA [at] gmail.com in your Contacts list. We will not contact you unless you win tickets. And yes, there are ways to enter multiple times to increase your chances of winning. Just keep checking back on this page every day and re-enter through the duration of the giveaway!